This year it seemed more like Steel Otter than Sea Otter. With the launch or relaunch of Chris Chance's Chris Cross with a Reynolds 853/Columbus Zona Nivacrom mix, VooDoo's Reynolds 853 Rada and the Franco Bicycles Grimes with Nova tubing, steel, as the cliché goes, is definitely real and Fairdale Bikes continues the theme. 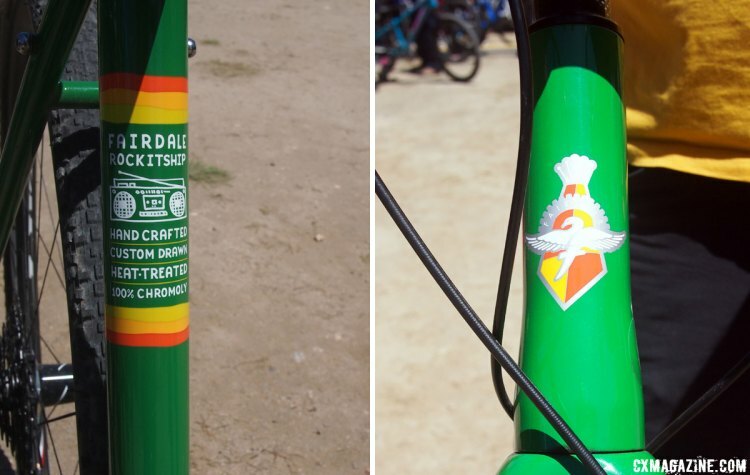 Fairdale may not be a known brand to many, but Cyclocross Magazine took an up close and personal look at the Fairdale Parser singlespeed crosser a couple of years ago. The brand is based out of Austin, Texas and has built up a reputation for affordable steel bikes and the occasional titanium model as well. 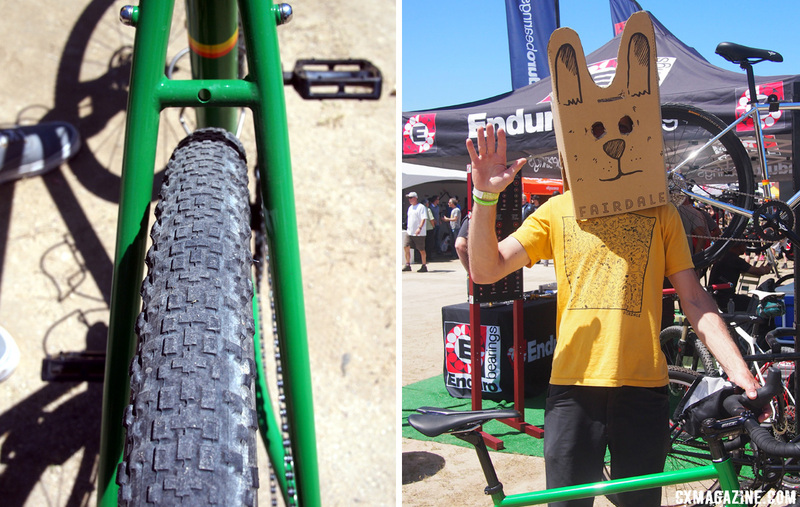 The Rockitship is a brand new model, just launched here at the Sea Otter Classic and it follows the path laid out by the current Goodship and Spaceship bikes. We talked to Leif Valin who, like Fairdale founder BMX Pro/Junkie Taj Mihelich, has an extensive background in the BMX world. How does this translate to the bigger wheeled bikes? 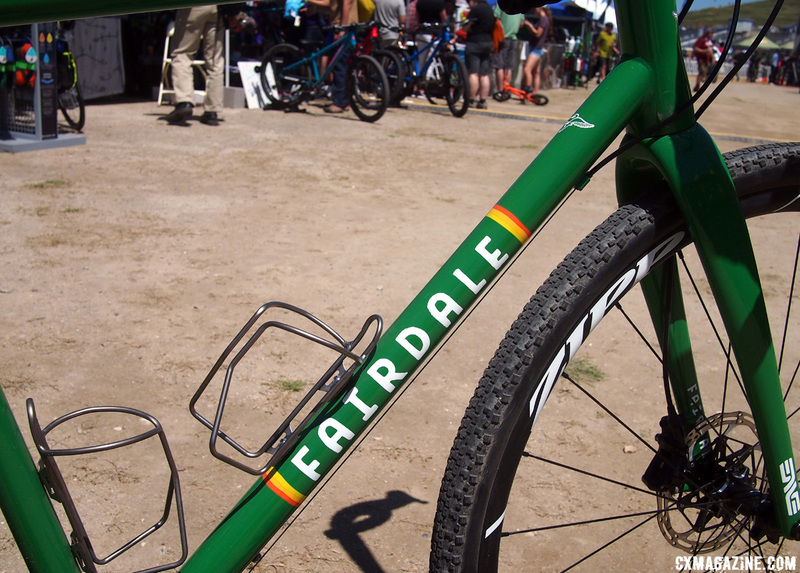 Ultimately, Fairdale has created a brand that is known for its toughness, simplicity and affordability. Valin explained, "The Rockitship is our go-anywhere drop bar bike with three bottle mounts, longer stays and [room for] 40c tires in the rear and 45c tires in the front." Valin continues to describe the frame, "the Rockitship uses custom butted, heat-treated Drawnright tubing that is ED (epoxy) coated inside for excellent corrosion protection. The bike has good, solid geometry." We hope to validate that claim in a future review of the bike. The bike uses 142x12mm axle spacing in the rear and the ENVE carbon fork uses a 100x12mm thru-axle. The pictured frame in these photos is a prototype, but the production model will have a threaded bottom bracket. Valin didn't have the geometry specs off the top of his head but said the head angle is about 72.5 degrees. 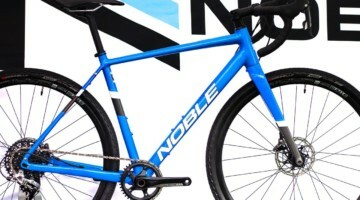 The Rockitship will be available in approximately two months as a frame and fork with pricing currently not set but expected to be around the $1400-$1500 mark (including the ENVE carbon fork).